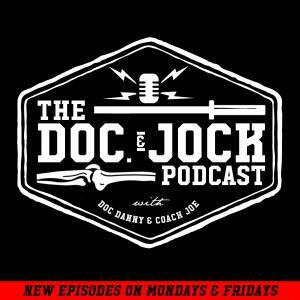 On this edition of the Doc and Jock Podcast Friday short Doc Danny answers a listener question. Kevin wants to know if it's ok to squat heavy on total knee replacement. Doc Danny answers the question in the most hated way ever: with a MAYBE. Danny explains that as long as the mobility and stability in the joint pass some tests then yes, Kevin can squat heavy (up to 80-90% of his former 1 rep max). How does Kevin know if his knee is mobile & stable enough to back squat you ask? Listen to Episode 175 to find out. Make sure to follow Doc Danny on social media @dannymattapt or @athletespotential also make sure to check him out at one of the upcoming Mobility WOD Level 2 Seminars http://mobiloitywod.com/courses.